I’ve been doing a good amount of low light street photography using Fujifilm ACROS 100 film pushed to 400 ISO. I’d go out around twilight and shoot until it got dark. I’ve enjoyed the results from that so much that I was inspired to do a low light photo shoot using ACROS pushed to 400 and see what the film would give me under those conditions. I’ve had a concept for a shoot that I’ve been wanting to do for a while now. 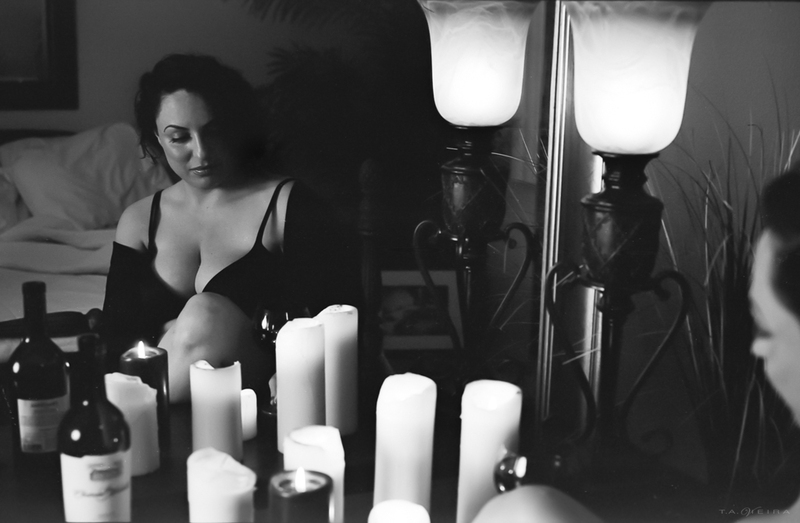 Mirrors, low light, candles and a beautiful woman. So I put everything together and set up a shoot with Geneva. She and I have shot together over the past four or five years and we always have a great time on shoots. I was really looking forward to this shoot because Geneva is beautiful and has a very classic look – just perfect for black and white photography, and I was really looking forward to shooting her with film. We did have a great time and I do like the shots we got. Here are a few more from the shoot.